The final region we visited in Turkey was called Cappadocia. It is located in the middle of Turkey. Cappadocia is not as fresh and green as the Izmir region. The terrain is sandier like Arizona. Also, the hills are different. Instead of rolling, green hills or snow-capped mountains, the hills consist of rock formations. In some parts these rock formations are jagged and sharp. Water sinks into the rocks and gets eroded by the wind that cuts in where the water sits. 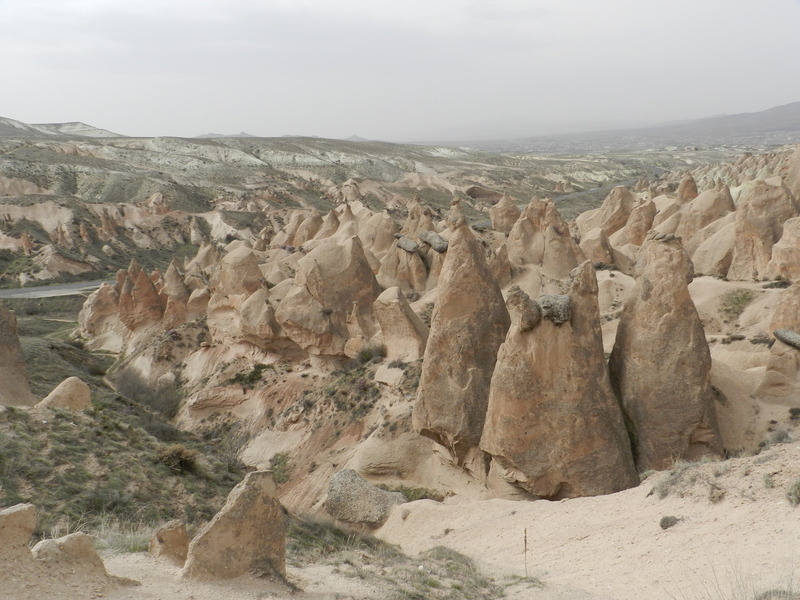 Because of this particular landscape, Cappadocia is famous for their caves. We actually got to stay in a cave hotel. It was a once in a lifetime experience. The rooms were built into the hillside. All the walls were cave walls. My door opened up onto a share porch with a few other doors. The view from there overlooked the small town we were staying in. it is not uncommon to see houses, store, or mosques partially built into the rocky landscape as well. As a result, the interior of these places stays relatively cool. 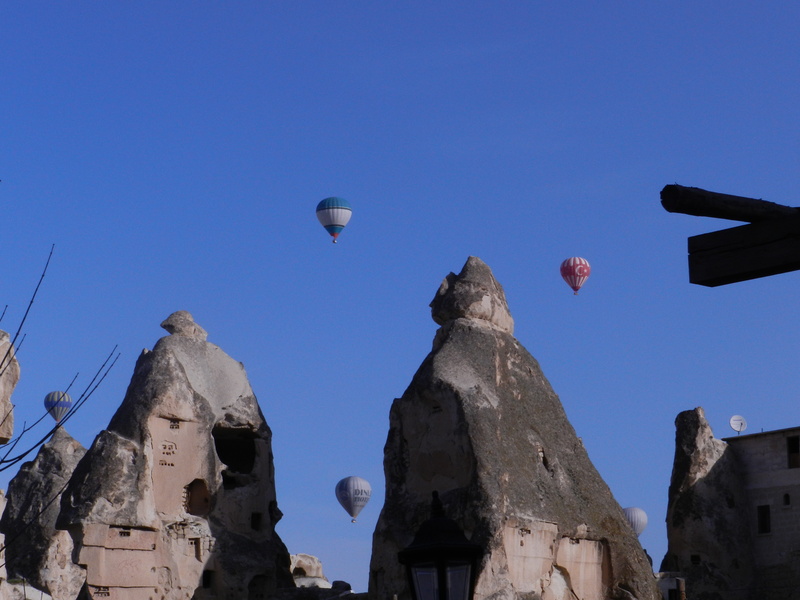 Also, Cappadocia is famous for their hot air balloon rides. The only downside is that a person has to wake up very early to ride in the balloons. The wind picks up throughout the day, so an afternoon balloon ride is out of the question. One of the most interesting things we saw in this particular region was an underground city. It is the largest underground cities in the Cappadocia region. We went about four floors underground, but the city itself extended much deeper than that. They had wineries, stables, cellars, and storage rooms. People wouldn’t necessarily live down there. It was used mostly for storage and protection. If these people were ever under attack, they would take cover in the underground city. This was a very hard place for enemies to attack successfully. However, if a person suffers from claustrophobia, it is recommended that they sit this activity out. 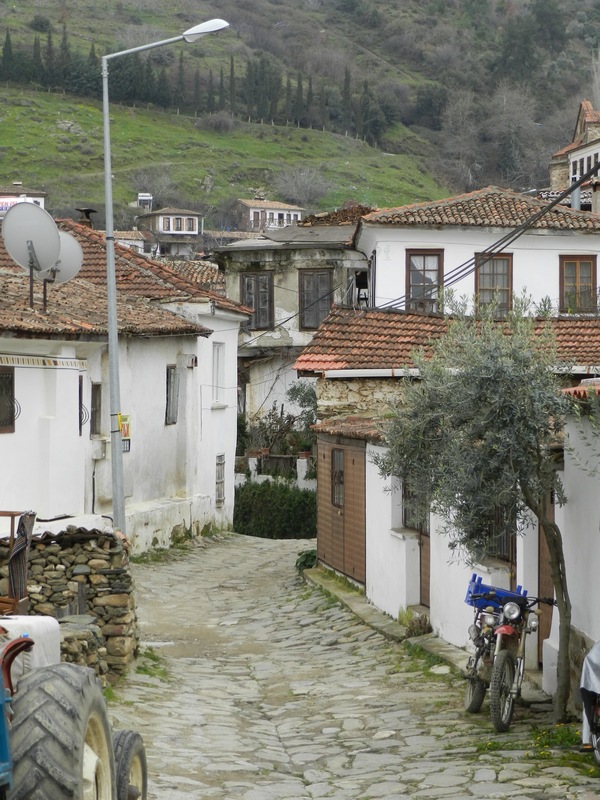 While we were in the Izmir region, we visited a small Greek village called Sirince. This town is the definition of quant. Only about 600 people lived in this village. The houses were all white cement/stucco construction with orange roofs that reminded me of terra cotta pots. The streets were made of stone that was nowhere near uniform. A person must always watch their step while walking on the streets of Sirince. Not only is it easy to trip on the streets, but one must always be vigilant of the steep inclines and declines of the streets as well. Since this city is tucked away in the hills, the streets follow the course of the slope. Along some of the streets were a few vendors selling local made goods and the usual tourist trinkets. This region of Turkey is famous for their fruit wines. People are welcome to sit down for a taste test of the local flavors. We sampled a large fleet of little wine servings. Some of the flavors included strawberry, raspberry, blueberry, peach, apple, blackberry, and a few others. It was an interesting taste but a fun experience. Also, as with all the other Turkish cities, Sirince had plenty of stray dogs and cats to keep a person company. This small Greek city is also a popular get away location for many famous people. After walking around the city, I can see why. 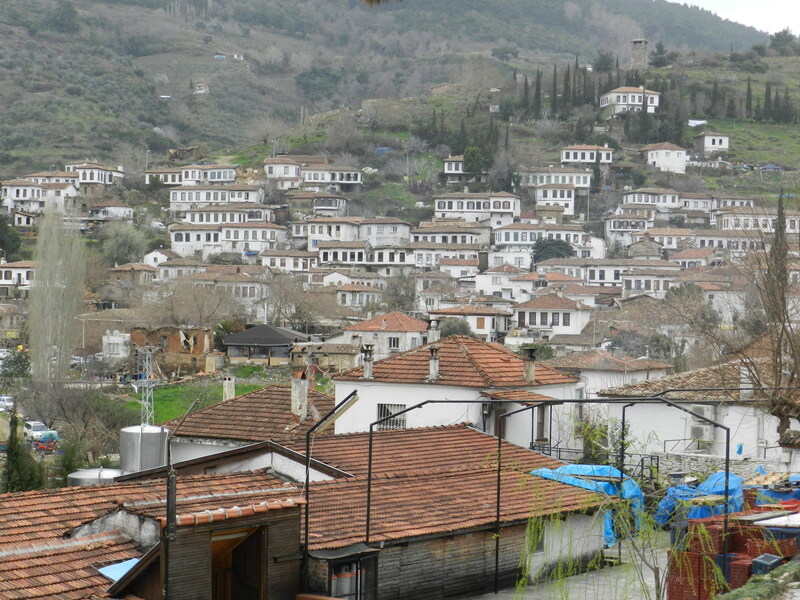 Sirince gives you the feeling that you are a thousand miles away from regular life and all the problems it brings. There is no shore with crashing waves. It just has a certain kind of silence that brings peace to the mind. Modern life is long gone for the time being. There are little bed and breakfasts scattered in the town. We were fortunate enough to be able to peak inside one. My first thought was, this would be an awesome location to spend a honeymoon. If I every get the chance, I would love to go back to this town and just spend a few days there to relax. Our second town we visited was called Kudasai. 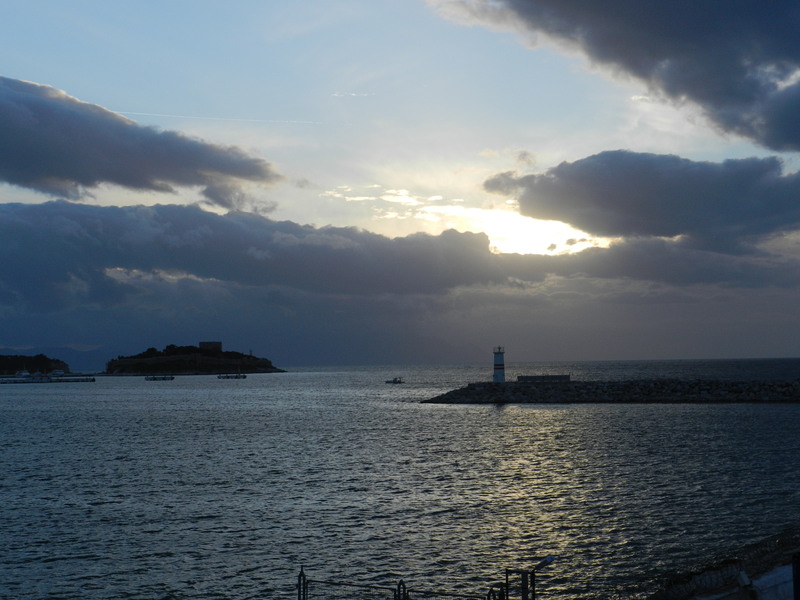 It is located on the Southwest corner of Turkey about an hour out of the city of Izmir. This town was quite the change from Istanbul. It is a small coastal city that is very touristic. Many cruise ships will port here for a while. Luckily for us, tourist season hadn’t quite started yet, so the town was rather quite. Our tour guide for this portion of the trip lived in this city. We ran into her each night as we were searching for supper on our own. Kudasai had its own kind of beauty. 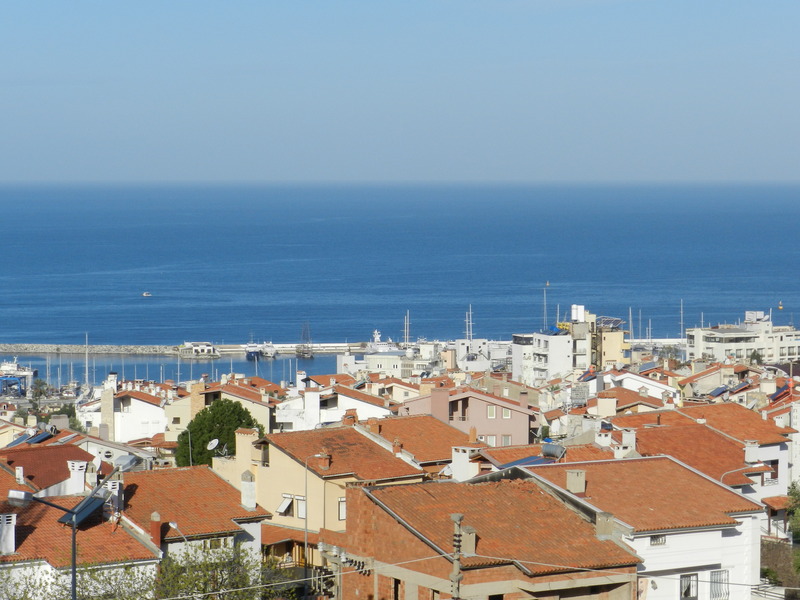 This town is located right on the Aegean Sea. In fact, that was the view I woke up to each morning in my hotel room. Also, every night we stayed there, we had the pleasure of viewing a gorgeous sunset over the sea. The whole town was built on a hillside. So, in order to walk to the coast from our hotel room, we had to walk up and down one giant slope. The housing consisted mostly of three or four story apartment style buildings. There were not many single-family homes. All the buildings were concrete with an orange roof. Of all the cities we visited, Kudasai had the least stray cats. The food we had in Kudasai was delicious. Surprisingly, I didn’t see as many seafood restaurants here as I did in Istanbul. Anyway, my favorite dish here was called a pida. It is a Turkish pizza, more or less, made for one. This dish consists of flat, oblong bread topped with meat, cheese, vegetables, and sauce. It was so delicious that I had it two nights in a row! The storeowner at this restaurant was very friendly. I could tell he loved his job. He really went above and beyond to make sure his customers had a pleasant experience while dining. Most people I encountered in Turkey were friendly, but this particular man was the most positive interaction I had with Turkish storeowners. Turkey is not blessed with the diverse wildlife we have here in the United States. They have smaller animals such as foxes, rabbits, squirrels, birds, etc. but they do not have the larger animals such as bears, deer, etc. The most common animal I saw was a cat. Turkey is known for their large population of stray cats. They were everywhere. As we ate lunch one day in Istanbul, our table was outside on the street. It was interesting to observe the cats on the street and on the roofs that popped in and out occasionally. They all seemed to be very similar in color and fur patterns, which leads me to believe that the cats will typically stick to one neighborhood. Turkish stray cats were much different than American stray cats. Stray cats around America look thin and boney, have eye disease, have matted fur, and can be squeamish. On the other hand, Turkish cats appeared healthy, well feed, and had the appearance of house cats. Their fur was soft and well groomed. Most cats in Turkey are friendly and may even jump in your lap. 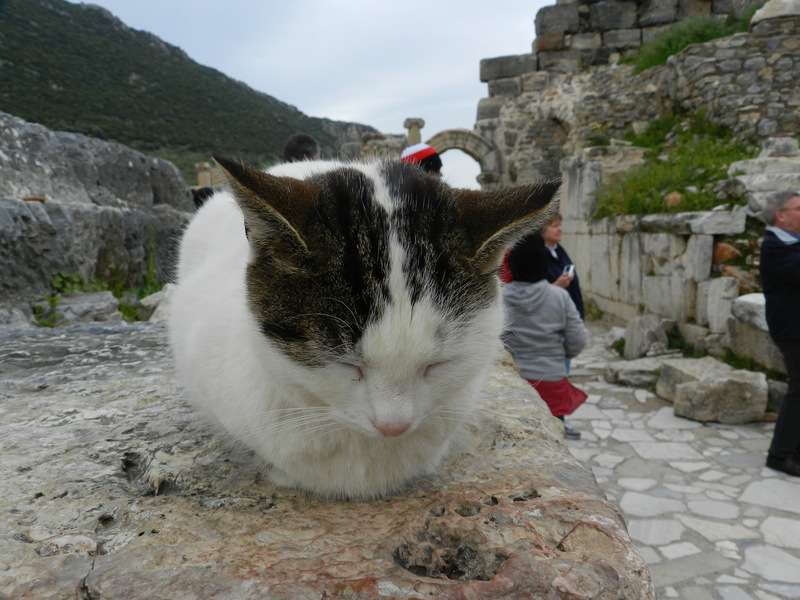 The place that had the highest concentration of cats was Ephesus. They were everywhere! Since there is no real town near Ephesus, these cats fed on mice, snake, scorpions, or whatever they could get a hold of. Another prominent animal in Turkey is the pigeon. 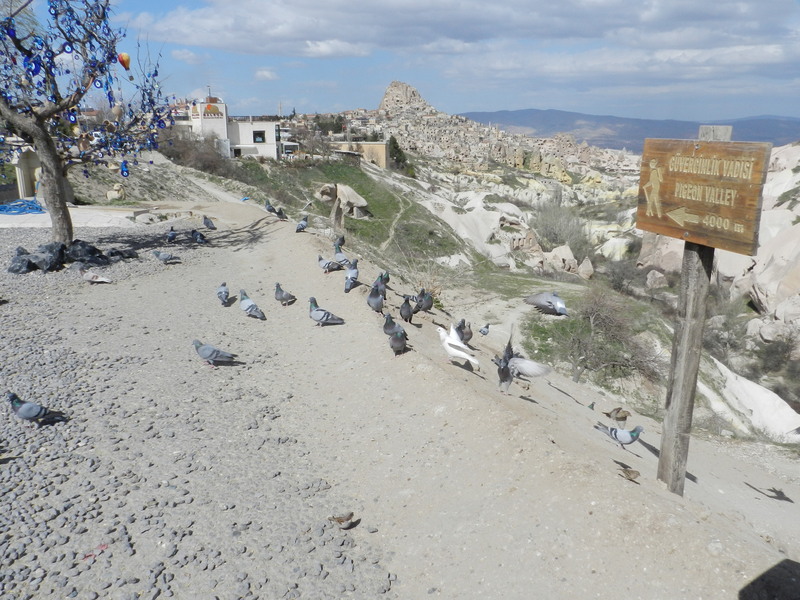 We learned that pigeons were a vital part of life back in the day, especially in the Cappadocia region. In this region, people would make pigeon holes at the tops of rock formations. The pigeons make their nests in these holes. Long ago, people would collect the pigeon droppings and use it for fertilizer or sometime in their paintings. We had a close encounter with these pigeons. On the last day in Turkey, we stopped at a panoramic viewpoint called Pigeon Valley. A large flock of pigeons would roam around this stop and eat the seed that tourists fed them. It is surprising how loud that flock of pigeons were when they all took flight at the same time. It made my heart jump a few times! 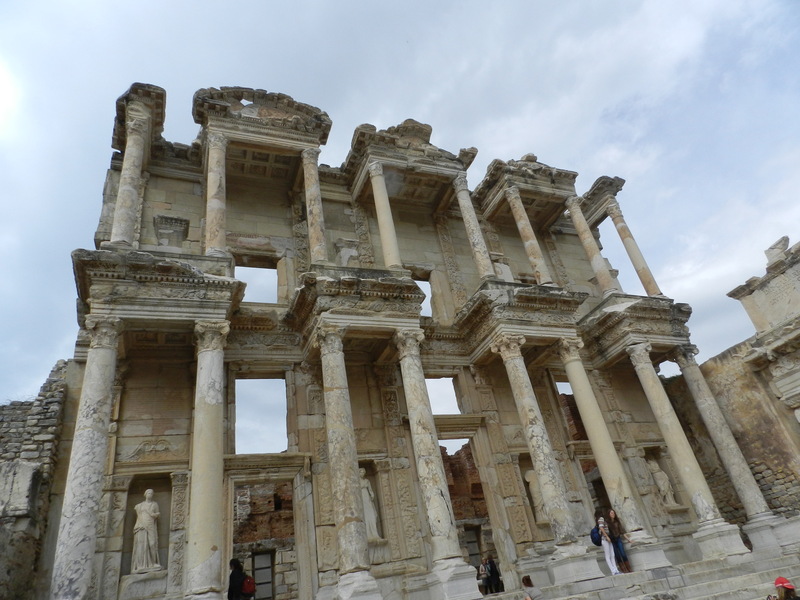 The second, and final, Greek/Roman city we visited was called Ephesus. It was only about an hour drive from our hotel in Kudasai. This site had more complete ruins compared to Hierapolis. When you walk into the site, the first building you come across is a Roman bathhouse. This was not a bathhouse built for luxury. This particular bathhouse was built outside the city to specifically cleanse people as they entered the city. It was a health prevention strategy to keep outside germs and diseases away from the city. Since these types of cities were densely populated back then, diseases spread rapidly and could force the entire population to evacuate. Some of the other buildings included a government meeting theater, various temples including an Egyptian temple, a bathhouse for leisure, homes of the wealth, a library, and a Greek theater. This town was a port city at one time. However, a large earthquake initiated the change in course of a major river. Eventually the shoreline pulled back to where it lies today, which is about eight miles away. There were many visitors due to the port. Since Egyptians visited often, the Greeks decided to build a Egyptian temple to appeal to visitor and bring more visitors to boost the local economy. Archeologists could tell that the remains were from an Egyptian temple because the stone was granite. Greeks mainly used solid marble when building. The library and the theatre were the main attractions of this site. Both of these buildings were in incredible shape. The library appeared to be two stories by the look of the façade; however, it was only one story. For some reason, they built a false front. The construction of the library was astounding. Everything was perfect and symmetrical. 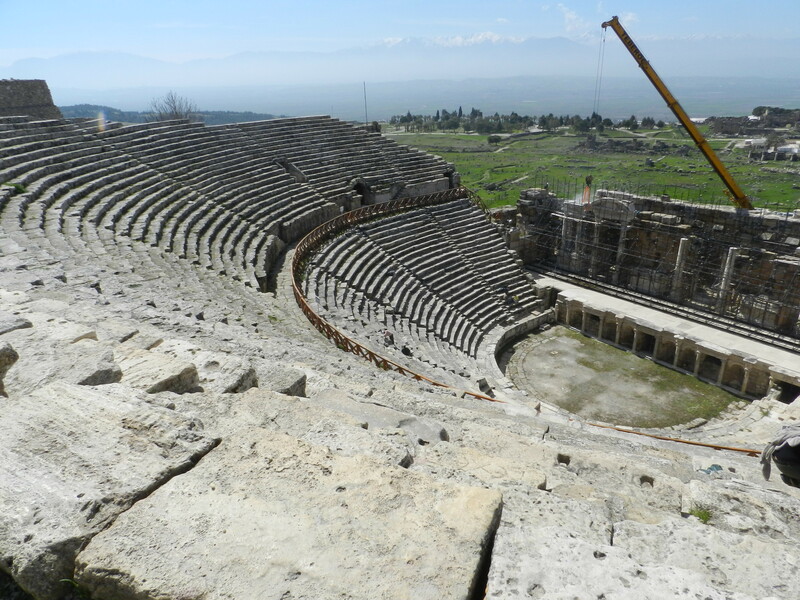 The theater at Ephesus was much larger than the theater at Hierapolis. Since it was still in good shape, Turkey used to allow modern concerts, like Sting, Cher, and many others, to perform there. However, after a few uses, that was deemed unsafe for the site itself and the concert-goers. The first Greek/Roman city we visited was called Hierapolis. This city was more of a vacation town back in its time. The city itself dates back to around 200 A.D. The ruins were not as complete as the ruins we saw elsewhere in Turkey, but it was still a fantastic experience. What was left on the site included: a Greek theater, the bases of temples, the market place of the city, and some graves. The rolling hills engulfed the city site. I could tell it started as a Greek city because the architecture flowed into the surrounding landscape. 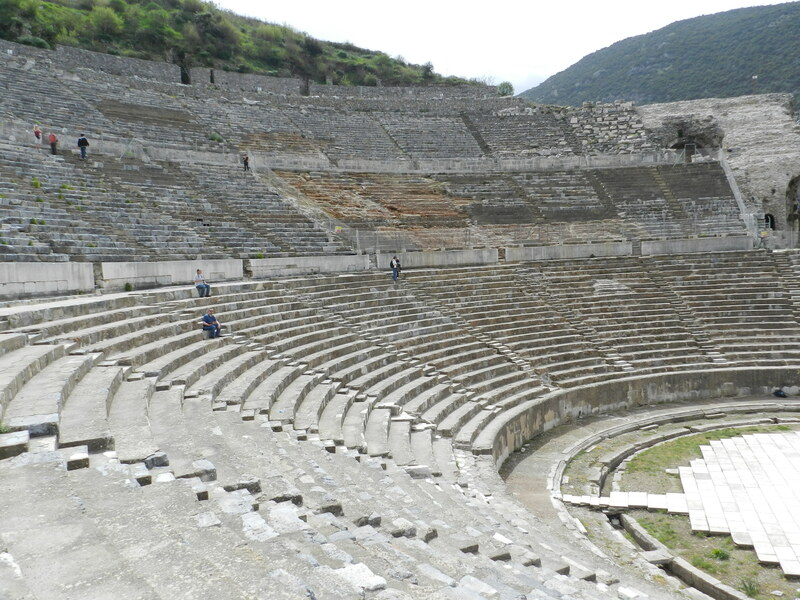 Greeks tended to build in that manner, especially when it came to building semi-circular theatres. The view from while standing on the city ruins was spectacular. Snow capped mountains lined the horizon in the distance. It was a beautiful site to roam around and explore on the bright, sunny day we visited. Also on site, were the Cascades. On the side of the hill laid an enormous, natural limestone deposit. From a distance, it appeared that a portion of the hill was covered in a large drift of snow. However, it was the pure white limestone. Fresh water flowed down the side of the limestone. It settled in small pools as it trickled down the hillside. The pools were no deeper than about a foot and a half and there were about eight to ten pools staggered. We were allowed to walk through the running water and these pools. The water felt so refreshing on my calves. It was a gorgeous light blue color. 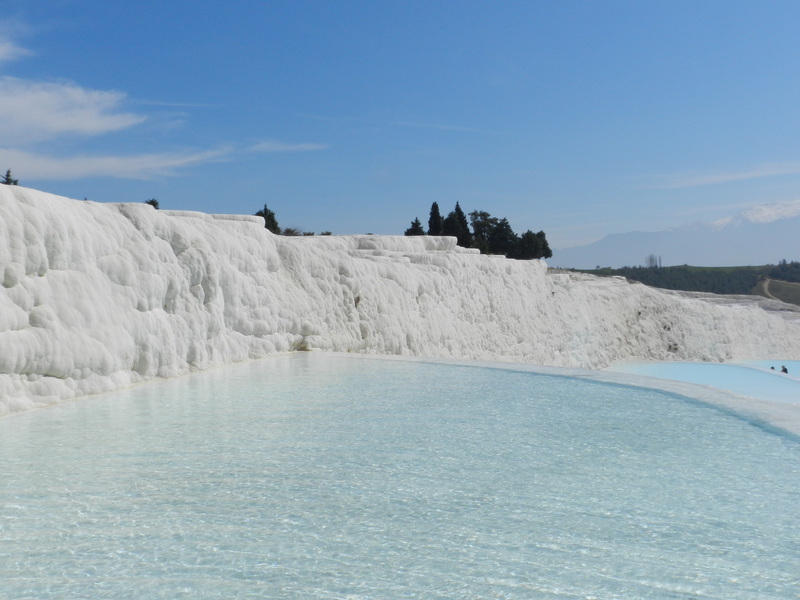 The contrast between the deep blue sky, the light blue water, and the pure white limestone rock was beautiful. The bottoms of the pools were covered in wet, fine sand. I think it was sand composed of limestone. It was the softest sand I had every felt. After walking through it, my feet felt like they had just received a pedicure.